Coffee & Conservation — Are your beans for the birds? Sustainable coffee is produced on a farm with high biological diversity and low chemical inputs. It conserves resources, protects the environment, produces efficiently, competes commercially, and enhances the quality of life for farmers and society as a whole. -- Smithsonian Migratory Bird Center, First Sustainable Coffee Congress. The criteria regarding shade cover for Rainforest Alliance certified coffee farms has eroded to the point that this certification can no longer be considered an assurance that coffee was grown on a farm that has habitat for birds or other wildlife. The (de)evolution of Rainforest Alliance shade criteria, March 2014. Discusses the original 2005 standard, minor revisions made in 2008 and 2009, the 2010 standard, and the changes proposed for the standard to go into effect in 2017. I outline what was included/proposed, and provided interpretation of what these changes meant ecologically and to consumers. Rainforest Alliance drastically revises shade requirement, April 2015. This outlined and discussed the third and final draft of the proposed 2017 standard. The new Rainforest Alliance shade requirements, February 2017. The final 2017 standard’s shade criteria. Once again, I discuss the ecological and practical ramifications. We are on the cusp of yet another change – and erosion – in the standard. In 2017, Rainforest Alliance announced they would merge with Utz (another certification), retain the Rainforest Alliance name, and develop a new standard. The first draft has now been released and the “shade criteria” is even more anemic, which I did not think possible for a certification that touts itself as protecting wildlife habitat. I focus on the shade criteria because it is very important for coffee farms, especially as it relates to birds. Importantly, this is the criteria many people have in mind when they are looking for “shade coffee” that is eco-friendly and provides habitat for birds and other biodiversity. Bear in mind there are related criteria, requirements, and “scoring” methods that have also undergone major changes (often not for the better, in my opinion). Again, the posts listed above will provide much more detail; here are the most relevant shade/canopy/vegetation requirements over time. I’ve indicated changes I think are especially important in brackets. b. The tree canopy comprises at least two strata or stories. Farms have at least 10% tree canopy coverage across the farm or group of farms, where appropriate in accordance with an agroforestry system that may include: trees in contour hedgerows, trees in strips (corridor system), trees in contiguous area (shade), trees in a mixed system, or trees on plot boundaries. 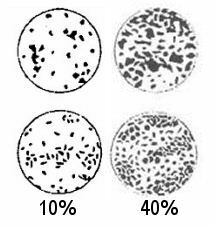 What 10% versus 40% canopy density looks like, from standard forestry charts (likely similiar to ones used by people that certify these farms!). Things to know: This is not a core criteria required for certification. The current 2017 standard does include at least a suggestion for 40% shade made up of 12 native tree species per hectare for coffee crops (that’s what the “or a shade canopy fulfilling the SAN canopy cover and species diversity parameters” is all about). That is no longer in the draft document. On their own website, Rainforest Alliance states: “On Rainforest Alliance Certified™ farms, coffee grows in harmony with nature: … wildlife thrives and migratory bird habitat flourishes.” This is not an accurate statement under the current standard, and may be even less likely under the proposed standard. Maybe your coffee came from a terrific farm with a diverse, highly structured shade canopy that supports resident and migratory birds and other biodiversity. Or it might come from a farm that has no shade at all over the coffee, or anywhere else on the farm if the certification covers a group of farms and there are some trees on one of the others. There is no consumer-facing transparency about this. I’ll repeat what I concluded after the last standard was approved. I believe this weakening of shade requirements devalues science-based shade and biodiversity criteria. If low requirements for shade production become mainstreamed and legitimized, and are seen as the true benchmarks for eco-friendly coffee production, habitat quality and biodiversity will suffer. Daily Coffee News has a post about the new standard, and you can read (and comment on) the entire draft standard via the links at the Rainforest Alliance website. Why did we decide to convert our certification standard into an outcome-based technical framework, and how did we achieve it? (SAN – the body that develops RA standards). This short paper describes why the Rainforest Alliance certification criteria have gone from verifying that coffee (or other agricultural product) was grown in a certain way, to it might have been grown or we are helping the farmer to one day grow the coffee in a certain way. It’s been my experience that consumers believe a certification means the former, not the latter. This category lists my posts on Rainforest Alliance — those regarding their evolving certification criteria are especially relevant. Do Sustainable Certifications For Coffee Really Help Coffee Growers? (NPR). This is a topic I have grappled with over the years. I’ve read many peer-reviewed papers that are often touted as “proving” the effectiveness of certifications. Yet the results put forward to the public usually do not touch on the weaknesses of the methodologies the authors (rightly) point out or the various caveats of the results presented in the discussion sections of the papers. New Policy Report Tackles Voluntary Sustainability Standards in Coffee. (Daily Coffee News). The future of certified coffee. (Global Coffee Report). An older piece on some of the same issues. New Report Says Shade-Grown Must Go Mainstream for Coffee’s Future. (Daily Coffee News). Shade, fertilization, and coffee leaf rust. (World Coffee Research). An update on WCRs research into this epidemic. For some background, here is my post on coffee leaf rust, and there are more posts linked on this page. Bringing coffee back into the shade. (India Climate Dialogue). This country’s coffee growers have a a long history growing coffee under shade. Meet the New Bird Friendly Seal! (Birds and Beans Canada). Speaking of shade-grown coffee, Smithsonian Bird-Friendly coffee (and other products in the future) has a new logo. Coffee’s Price Collapse: How Did We Get Here and What Can We Do? (Daily Coffee News). When the Market Drops Again, Who Will Be Left to Speak Up? (SCA News). How to support specialty coffee. (Imbibe Magazine). Quit buying cheap coffee. Here’s how. We’ve been here before and the results are catastrophic for farmers and have a ripple effect throughout economies. Read my piece about corporate coffee for an overview. Coffee farmers struggle to adapt to Colombia’s changing climate. (The Conversation). The elephant in the room. Walmart tried to make sustainability affordable. Here’s what happened. (The Conversation). Not specific to coffee, but an interesting read about market forces. Rainforest Alliance and UTZ (Certified), two major certifiers of coffee and other products, are merging later this year, and will operate under the Rainforest Alliance name. The current executive director of UTZ, Han de Groot, will head up the new organization. They plan to come out with a new standard, codifying the requirements for certification, in early 2019. The strengths of UTZ certification are in supply chain traceability and transparency, but overall the environmental criteria are not very specific or quantifiable, and the requirement for shade in coffee is especially loose and subjective. The standard for Rainforest Alliance certification just underwent a major overhaul that more or less gutted the formerly decent shade requirements for coffee. Both are process-oriented certifications. That is, certification is granted for farms working towards the criteria in the standard. There is no way to distinguish which or how many of the criteria have been met. News of the merger didn’t surprise me. In many ways, the standards of the two organizations were becoming more similar, and both have become largely engaged with large coffee and food corporations (which I believe is largely responsible for the downward pressure on the stringency of environmental requirements). Many coffee producers had dual certifications, and this merger will mean they only have to go through one certification process, which is much more efficient and definitely a positive development. If the new standard contains the best of both current standards (which is hardly a given, considering the simplification and easing of many of the requirements that have taken place over time) I will consider this a solid foundation certification. Currently, the ground floor is occupied by the Baseline Common Code of the Global Coffee Platform (formerly the 4C Code of Conduct), the bare minimum of decent human and environmental practices in coffee production. If all coffee can instead meet a new, non-waterered-down Rainforest Alliance/UTZ standard, the world will be a better place. But from a habitat and environmental point of view, we will still have a long way to go, as there is a very wide gap between the Rainforest Alliance shade and habitat requirements and those of Bird-Friendly certification. Further, it is not known how requirements for fair prices (such as those in Fairtrade/Fair Trade certification) will be incorporated, as neither RA nor UTZ has any price guarantees built into their current standards. We will have to see how the new organization develops requirements in the year ahead. A short round-up of coffee news. Keurig is finally designing a more eco-friendly K-cup, Washington Post. I have written many times about K-Cups: the excess waste, when the company said they were recyclable but they really weren’t, as well as the high cost and better alternatives. This article announces the same old story: by 2020 K-Cups will be recyclable, they say this time by changing the plastic composition. The 2020 goal has been in place for many years. This article quotes the company as saying, “The consumer is going to brew it, peel and empty it, and pop the pod into the recycling bin in the same behavior they would do with a yogurt cup.” First, many people will NOT go to the trouble of peeling off the foil top and cleaning out the grounds. Second, the plastic will now be polyproplene (“#5”), a type of plastic which is still not accepted by many curbside services, especially if not in tub or bottle form. Sigh. Other single-serve pods used in these brewers also tout their sustainability. The Consumerist, in the article Ad Watchdog: These ‘100% Compostable’ Coffee Pods Don’t Go In Your Backyard Compost Pile, warns people to be careful of these kinds of claims. A Strong Case Against a Pesticide Does Not Faze E.P.A. Under Trump, New York Times. Chlorpyrifos is one of the common pesticides used on coffee. Buy organic. Everything. Colombian Coffee Growers Adapt to a Changing Climate, The Ecologist.